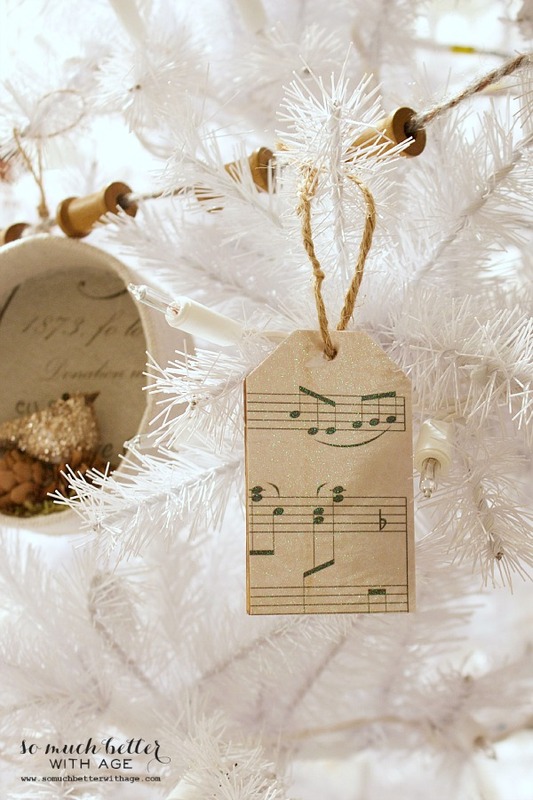 Dreaming of a musical Christmas with these DIY sheet music wooden tag ornaments! If you have been following me on Instagram, you might have noticed I got a white Christmas tree. I’m so excited to show you it all decorated. Right now it is only partially decorated. 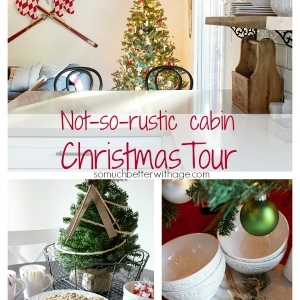 The Christmas tree that you might recall from last year is going to the not-so-rustic cabin in the woods along with most of the ornaments. I really wanted a neutral theme this year (big surprise there!) so I had a bunch of ornaments that I could still use, found some ornaments on sale, and I’m making some too. These are really easy DIY ornaments: Sheet Music Wooden Tag Ornaments. 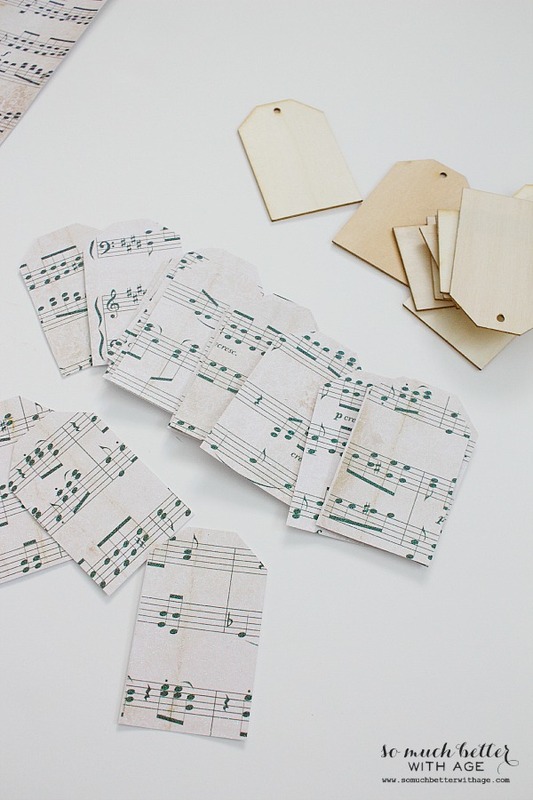 I found these wooden tags at Michael’s and the sheet music scrapbook paper there as well. The best part? That scrapbook paper is already GLITTERED! 1. 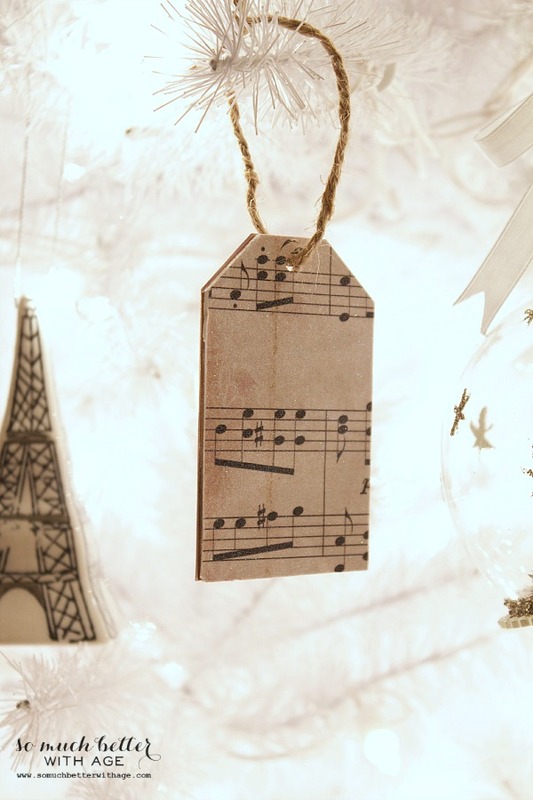 Trace out tags from the sheet music, two for each tag. 2. 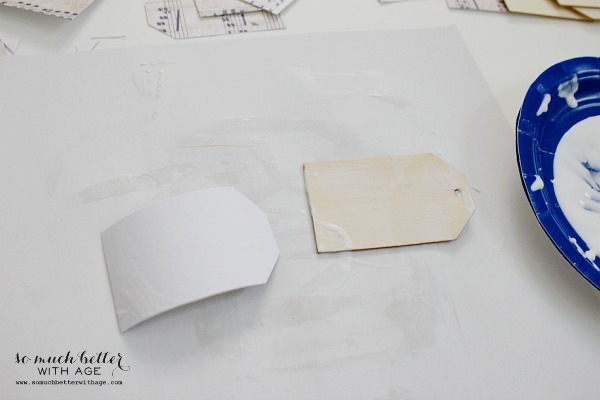 Paint Mod Podge over the back of the paper tag and onto one side of the wooden tag. Use a generous amount. Hold and press together for about 30 seconds. Repeat for the other side. 3. Paint Mod Podge along the edges. 4. Put the tags under a stack of books for at least an hour. Cover the tags with saran wrap in case some of the glue squeezes out. 5. 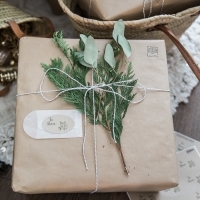 If the paper is a bit larger than the wooden tag, use an exacto-knife to cut off so the edges are clean. 6. Thread twine through the hole by pushing through with a pen or pin. I love them! 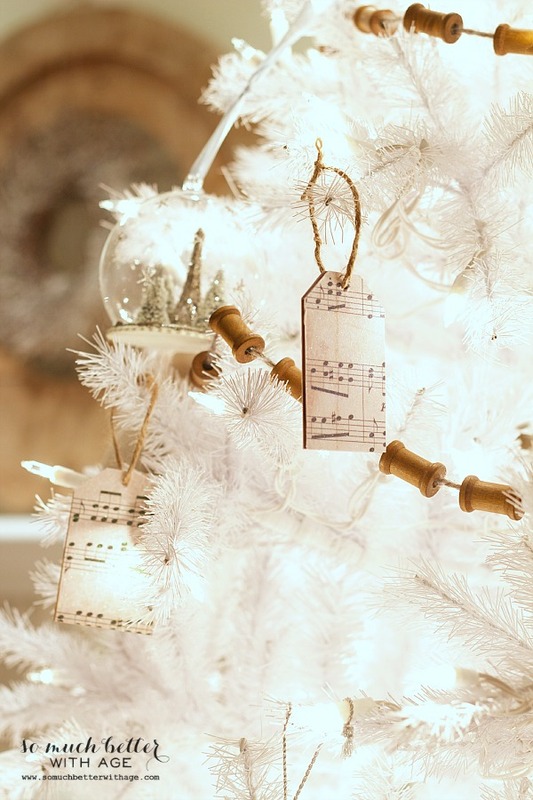 So easy and adorable for my new white tree. I love how the brown wooden edges show through. My mantel is coming along nicely too. 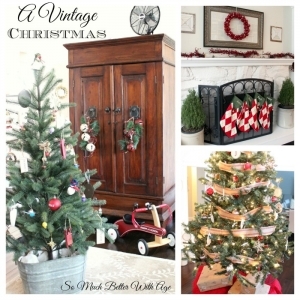 Sweet … Totally going to do the wooden spool idea in your pics too! Saw some at Michael’s but was not sure what to do with them … Thanks for the inspiration! Seriously??? So cute!! And so easy my daughter who is six can do it!! Thanks so much for sharing!! My musician daughter would love a set of these to decorate her apartment. 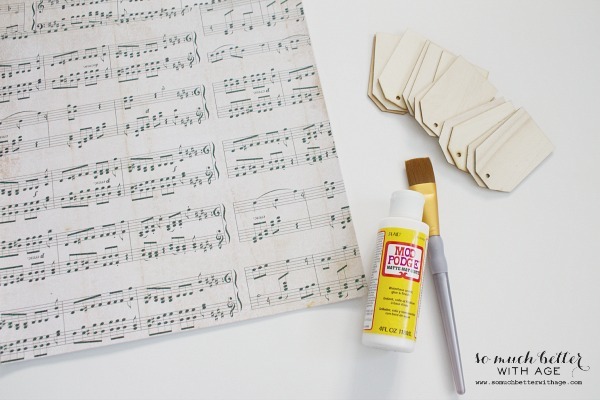 She might lop off my hand if I were to use even old sheet music but I found a roll of brown kraft gift paper that had ‘sheet music’ printed all over it! She’ll love these tags! Thank you for the great idea. They’re so cute! 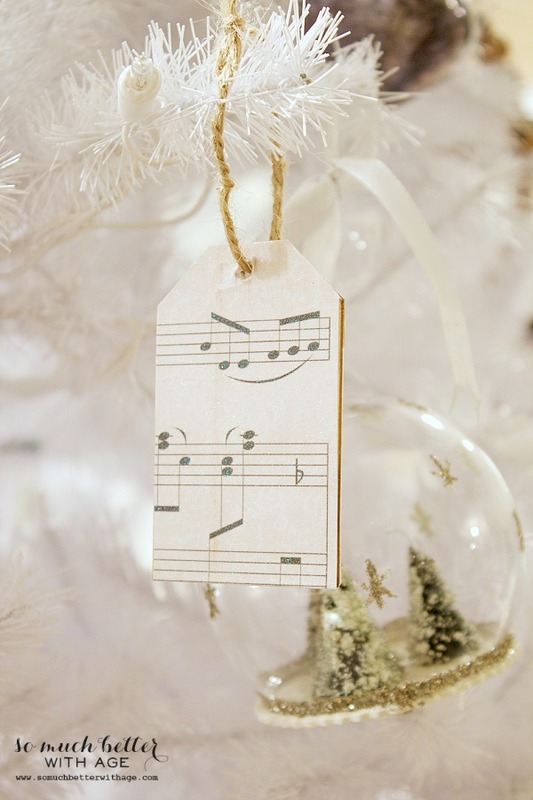 Can’t wait to make some for my daughter’s music teachers. Thanks! 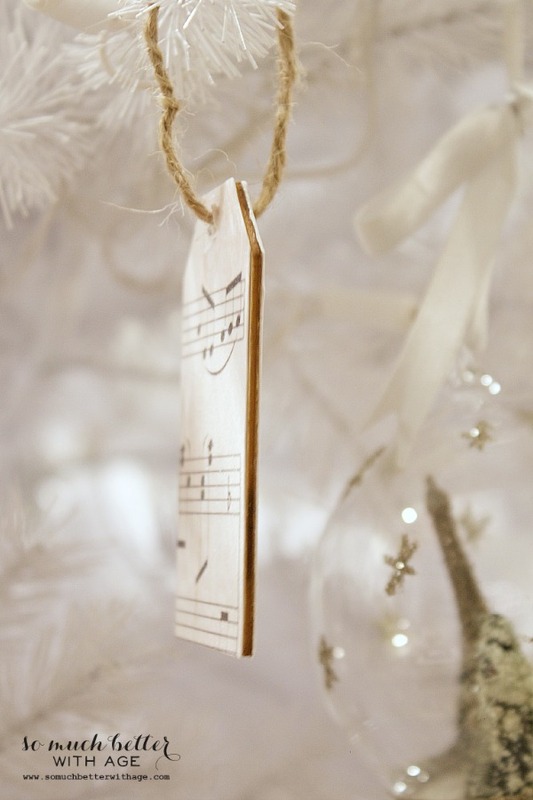 Beautiful ornament! Its just perfect…. Very classy, and I love how simple it is too. This is beautiful! Thanks so much for sharing with us. 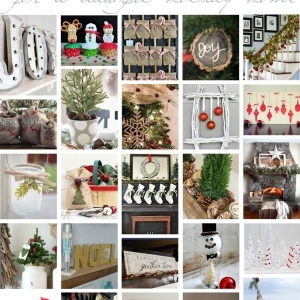 Stopping by from the Party Blog hop…what a great and simple idea!! 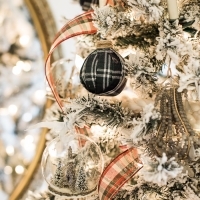 I bought some ornaments that would go very well with your idea and I think I even have some wooden tags! 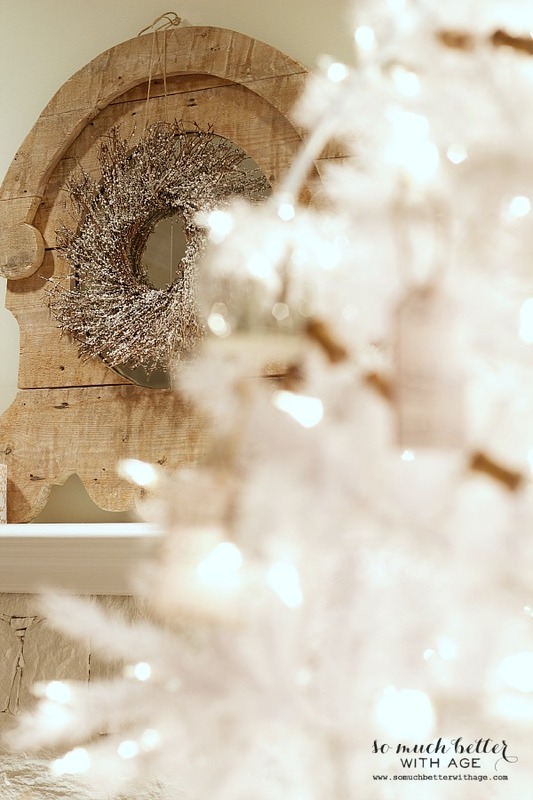 Great inspiration here and I love the white tree! I am off to see more of your blog! Have a happy day!